Scene from Franklin’s Narrative of a Journey to the shores of the Polar Sea, in the years 1819, 20, 21 and 22 (1824). Icescapes encountered by Captain John Ross, published in A Voyage of Discovery, made under the orders of the Admiralty, in his Majesty’s ships Isabella and Alexander for the purposes of exploring Baffin’s Bay, and enquiring into the possibility of a North-West Passage (1819). An illustration from Parry’s chronicle of the 1821-23 expedition. Parry’s vivid account was published as Journal of a second voyage for the discovery of a North-West Passage from the Atlantic to the Pacific; performed in the years 1821-22-23, in His Majesty’s Ships Fury and Hecla, under the order of Captain William Edward Parry (1824). Left: Parry’s lavishly illustrated account of his second expedition pays close attention to the life and material culture of the Inuit encountered by the expedition. Journal of a second voyage for the discovery of a North-West Passage from the Atlantic to the Pacific (1824). Right: An illustration of some of the Franklin Relics found by Dr. John Rae, published by Walter William May in A Series of Fourteen Sketches Made during a Voyage up Wellington Channel (1855). An illustration from Charles Francis Hall, Life with the Esquimaux (1864). A depiction of Nelson’s supposed encounter with a polar bear, from The Life of Admiral Lord Nelson, K.B. : from his Lordship’s manuscripts (1809). The departure of Erebus and Terror depicted in the Illustrated London News, 24 May 1845. Left: Manuscript illustration of an Inuit woman and child brought to England as captives by Frobisher. From the manuscript of Sir Hans Sloane. Right: A manuscript depiction of Frobisher’s conflict with Greenland Inuit, most likely battle at Bloody Point. From the manuscripts of Sir Hans Sloane. A lot of books cross my desk here at Canadian Geographic, their publishers posting copies in hopes of a review, an extract, a tweet — anything, really, to garner some attention for the work and its author. Some of these books make sense for us to write about because they cover topics our readers care about — wildlife, exploration and photography, for instance. Some of these books are also very good and, after we’ve written about them, end up in our reference library, where they’re occassionally plucked from the shelf in the aid of story research. But the most impressive of book I’ve seen so far this year is one that, had it not been sent to me, I would covet. In fact, I’ll readily admit to wanting to spirit home the copy of Lines in the Ice: Exploring the Roof of the World that I received earlier this month, about two weeks after it quietly became available in Canada. I still just might. Billed as “a visual history of Arctic exploration and how it has shaped the modern world,” Lines in the Ice is a spectacular work, one that anyone even remotely interested in the Arctic should have in their collection. Its author, Philip J. Hatfield, the lead curator for digital mapping at the British Library and a Fellow of the United Kingdom’s Royal Geographical Society, has drawn on the library’s impressive collection of artwork, maps and illustrations — many of which are rarely seen outside the library itself — and writes compellingly and accessibly about a host of topics, including Inuit culture, Arctic zoology, the polar influences in Coleridge’s The Rime of the Ancient Mariner, and Arctic geography and geopolitics. The excerpt below, which is an abridged version of the book’s introduction, and the accompanying images above offer a taste of what readers can expect. Ships fighting against a freezing sea. Masts and ropes caked in ice. Crews of men hauling sledges over crumpled and broken landscapes. These are the mental images conjured when many think of the Arctic and the history of its exploration by Europeans, Russians and Americans. However, this is not the only human history of the Arctic – a polar region slippery to define but broadly consisting of the Arctic Ocean and parts of Alaska, Canada, Finland, Greenland, Iceland, Norway, Russia, and Sweden. Indigenous communities – the Inuit, Eskimo, Sami, Nenets and many others – have a long history of living in and around the Arctic, using its bounty to sustain themselves and drawing their culture and folklore from its landscape and seasonal rhythms. Elsewhere, in the present day, the idea of the Arctic has also become more multifaceted. Although exploration to find trade routes and resources is still important, ideas formed around borders, civil infrastructure, scientific research and biome conservation, among other concerns, now shape our imagination of the Arctic. Crucially, both the distant past and the contemporary world as sketched out above are connected by the history of exploration. The work of explorers – not to mention the traders, hunters and trappers who, historically, followed them – is a bridge between these two eras. The major period of exploration by Europeans, Russians and Americans, stretching from the fifteenth century to the early twentieth century, had a huge impact on indigenous societies across the Arctic. The arrival of Western explorers broadened the horizons of these cultures, but also introduced new tools, mechanisms of economic exchange and diseases – factors that would reshape populations and create conflict between communities for generations to come. These dynamics have reshaped the Arctic world of the indigenous peoples as we see it today. Moreover, the territories explored and endeavours undertaken by explorers have had a lasting impact on our contemporary understanding of, not just the Arctic, but the world around it. The border claims of modern nations are underpinned by the maps, lost ships, cairns and claims of Victorian explorers; strands of scientific analysis, including those relating to climate change, have been opened up and evidenced by the findings of historic expeditions; and Arctic wildlife still bears the scars of those who made the most of adventurers’ finds. On top of this, some of the names we associate with the Arctic, even those most famous, such as HMS Erebus and Terror, were also part of a growing understanding of the polar world to the south of the globe. Our understanding of the Antarctic would not be what it is today without the lessons learnt in the Arctic, the crews who gained experience there and the technologies developed on those expeditions. Even the idea of writing to endure the dark winter months of the poles, which historically produced fantastic artefacts such as the South Polar Times, owes its foundation to the exploration of the Arctic during the nineteenth century. In the contemporary era, the basic motivation of European and American explorers – the pursuit of resources and trade routes in order to gain financial and political advantage – is fundamentally unchanged. However, the search has shifted from a hunt for gold to a race for ‘black gold’ (oil). The Arctic continues to be reconfigured by this desire for wealth, which is also, simultaneously, inspiring creativity, cultural growth and even the development of spiritual attachments to the land, as it has done for thousands of years. Lines in the Ice: Exploring the Roof of the World is an attempt to illustrate this rich, interconnectedhistory through its human legacies. The collections of the British Library, as well as those of a large number of other world heritage institutions, provide windows through which we can reflect on the ways human cultures have engaged with the polar regions, especially the Arctic, over a long period of time. This book attempts to take a rounded view of the Arctic world, drawing particular attention to the importance and significance of indigenous cultures and their history to the Arctic. However, as the main focus is on how non-Arctic societies, such as Britain, relate to this polar region, it lingers particularly on the work of explorers and their agency in shaping the Arctic region we know today, not to mention how this underpins our deeper understandings of the world at large. The history of human engagement with the Arctic, especially where Europeans and Americans are concerned, may not seem to be an overtly positive one, especially as we face a period in which trade and resource extraction are competing with the race to understand our changing climate. However, while we can see a long history of greed and conflict in the material laid out in this book, inspiration, diligent enquiry, a strong desire to protect and conserve, a spiritual appreciation of the land and its bounty, not to mention a will to preserve these lands for generations to come, are all also discernible. 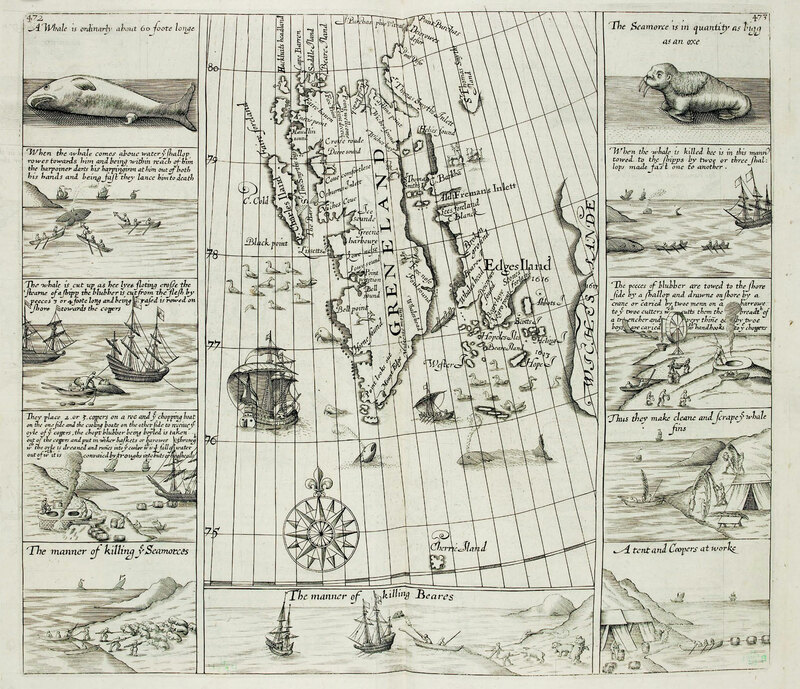 The process of whale hunting, as depicted in Purchase His Pilgrims (1625).